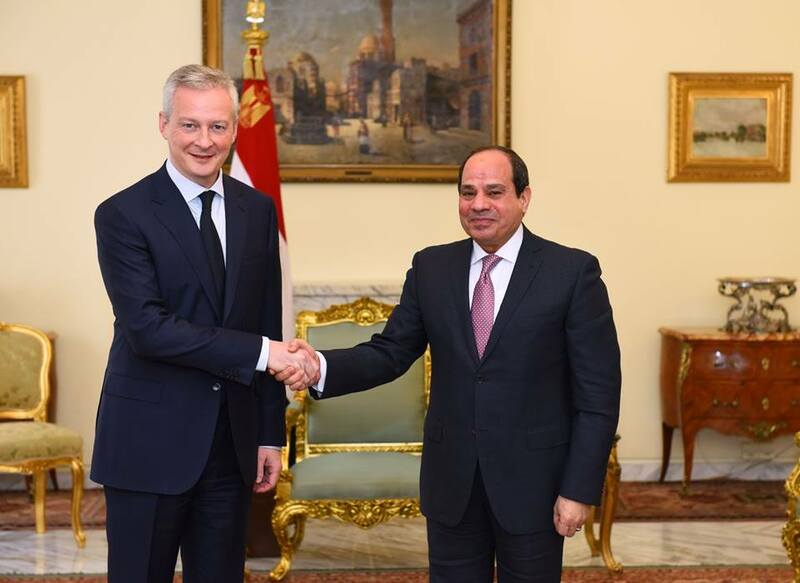 Egyptian President Abdel Fattah al-Sisi on Sunday received France’s Finance Minister Bruno Le Maire, in the presence of the Minister of Investment and International Cooperation Sahar Nasr and the French ambassador in Cairo. Presidential spokesman Bassam Rady said that Le Maire conveyed greetings to Sisi from French President Emmanuel Macron. Le Maire affirmed his country’s pride in the strong relations between Egypt as a cornerstone of stability in the Middle East, and his country’s keenness to support these relations further in order to strengthen and develop their existing partnership. He also praised the wise decisions that led to the positive development seen in the Egyptian economy’s indicators, as well as the unprecedented achievements of Egypt’s giant national projects such as the New Administrative Capital. Rady said that the Egyptian President expressed Egypt’s aspiration to maximize cooperation between Egypt and France on various regional and international issues, especially the current crises in the Middle East whose repercussions extend to the Mediterranean region. He added that the meeting saw talks on various issues related to bilateral relations and ways of maximizing the partnership between the two countries especially within the sectors of health, new and renewable energy, transport and logistics. Sisi highlighted the priority of economic and trade cooperation between Egypt and France and the enhancement of French investments within the Egyptian market, especially in light of the positive results from Egypt’s comprehensive economic reform program. He said that the promising and broad Egyptian market represents a starting point for French exports to the various markets in the region, as well providing huge investment opportunities for the French business sector in Egyptian national projects, such as the development of the Suez Canal and the new cities being constructed throughout the country.